Not to be confused with Clinton County, Missouri. For the unincorporated community in Phelps County, see Clinton, Phelps County, Missouri. 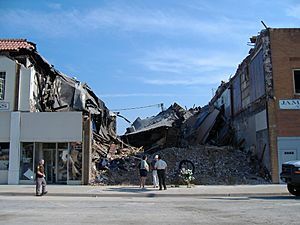 On June 26, 2006, a building in the historic town square collapsed; on the second and third floors, an Elks Lodge (Benevolent and Protective Order of Elks) meeting was taking place. The leader, Tony Komer, who was on the third floor of the building preparing a speech, is the only one who died. Nine people were pulled from the rubble, while the rest left on their own power. In the "Olde Glory Days" parade, which occurred less than one week after the accident, Komer was memorialized, and Elk's Lodge members from many parts of Western Missouri marched to show their support for the Clinton Lodge. The Anheuser-Busch Brewing Association Building, Clinton Square Historic District, William F. and Julia Crome House, Judge Jerubial Gideon Dorman House, Gustave C. Haysler House, and C.C. Williams House are listed on the National Register of Historic Places. Clinton is located at (38.370067, -93.771689). According to the United States Census Bureau, the city has a total area of 9.26 square miles (23.98 km2), of which, 9.14 square miles (23.67 km2) is land and 0.12 square miles (0.31 km2) is water. As of the census of 2010, there were 9,008 people, 3,935 households, and 2,371 families residing in the city. The population density was 985.6 inhabitants per square mile (380.5/km2). There were 4,454 housing units at an average density of 487.3 per square mile (188.1/km2). The racial makeup of the city was 95.1% White, 1.9% African American, 0.4% Native American, 0.3% Asian, 0.5% from other races, and 1.8% from two or more races. Hispanic or Latino of any race were 2.0% of the population. There were 3,935 households of which 27.9% had children under the age of 18 living with them, 42.2% were married couples living together, 13.3% had a female householder with no husband present, 4.8% had a male householder with no wife present, and 39.7% were non-families. 34.5% of all households were made up of individuals and 16.1% had someone living alone who was 65 years of age or older. The average household size was 2.24 and the average family size was 2.82. The median age in the city was 40.6 years. 22.6% of residents were under the age of 18; 8.5% were between the ages of 18 and 24; 23.4% were from 25 to 44; 25.1% were from 45 to 64; and 20.5% were 65 years of age or older. The gender makeup of the city was 46.9% male and 53.1% female. As of the census of 2000, there were 9,311 people, 3,978 households, and 2,502 families residing in the city. The population density was 1,007.6 people per square mile (389.1/km²). There were 4,342 housing units at an average density of 469.9 per square mile (181.4/km²). The racial makeup of the city was 95.49% White, 1.77% African American, 0.92% Native American, 0.31% Asian, 0.50% from other races, and 1.00% from two or more races. Hispanic or Latino of any race were 1.03% of the population. There were 3,978 households out of which 27.8% had children under the age of 18 living with them, 47.0% were married couples living together, 12.1% had a female householder with no husband present, and 37.1% were non-families. 33.1% of all households were made up of individuals and 16.3% had someone living alone who was 65 years of age or older. The average household size was 2.26 and the average family size was 2.84. In the city, the population was spread out with 23.4% under the age of 18, 8.8% from 18 to 24, 25.6% from 25 to 44, 21.2% from 45 to 64, and 20.9% who were 65 years of age or older. The median age was 39 years. For every 100 females there were 88.4 males. For every 100 females age 18 and over, there were 82.7 males. The median income for a household in the city was $28,079, and the median income for a family was $32,378. Males had a median income of $26,834 versus $19,096 for females. The per capita income for the city was $16,282. About 11.9% of families and 15.5% of the population were below the poverty line, including 21.0% of those under age 18 and 13.3% of those age 65 or over. Clinton lies at the western end of the Katy Trail, a 225-mile long state park used by cyclists, runners, and horseback riders. The rail trail is built on the path of the old Missouri-Kansas-Texas Railroad, which was abandoned between Clinton and Sedalia in 1989. The former Katy railroad from Clinton south to Nevada (MO) is still in operation by the Missouri and Northern Arkansas Railroad (RailAmerica). The city is also situated near Truman Lake which is widely known for its excellent boating, fishing, camping, and other related activities. Clinton is also home to two of the area's finer 18-hole golf courses. September 12, 2007, the Tour of Missouri bicycle race began stage 2 from Clinton, Mo. The initial take off began from the historic downtown square, and ended in Springfield, Mo. Clinton, Missouri Facts for Kids. Kiddle Encyclopedia.